As Nancy introduced, this is the third of four posts in our Spring WCTF Blog Series, Achieving Impactful Outcomes: Observations from WCTF. In today’s post, WCTF Program Manager Anthony Britt will explore a few often underestimated elements of successful program design. I came to CommCorp from the public education sphere, where the most effective lessons were planned with the end goal in mind. In the last blog post, Theresa shared how we use data to inform our decision-making and to maximize the placement of participants into sustainable employment- our main objective. With the Massachusetts unemployment rate at 3.6%, many businesses are having a tougher time finding qualified candidates for their open positions. How can sectoral employment programs help close this gap? While the programs we fund take on different forms based on the needs of local businesses and job-seekers, we’ve seen a number of essential elements emerge as keys to success, such as employer-informed technical skills training and integrated support services. At the same time, we’ve seen that some elements of program design are often underestimated, such as recruitment and placement strategies. Given the significant amount of work that goes into planning training, the time and resources it takes to effectively recruit robust cohorts can be overlooked. There is value in starting your outreach early and making multiple points of contact with candidates as you may need to speak with four-plus people for each slot in the class. Choosing partners strategically can expand your reach. In addition to working with One-Stop Career Centers, our programs have found it beneficial to partner with a diverse set of referral sources. Recently, one program in Western Massachusetts held a bilingual event in partnership with a longstanding community-based organization who possessed Spanish-language proficiency in order to provide potential participants with exposure to hospitality and food preparation, the chosen occupational target. Other programs engage recruits through social media in addition to traditional flyers or by canvassing at natural gathering spots such as the local supermarket or DMV office. Once a program has graduated a cohort or two, word-of-mouth from alumni can help spread awareness amongst their networks and even result in a level of familiarity amongst participants from day one. Successful programs are able to identify the gap between businesses’ needs for skilled workers* and the current credentials and skill levels of their target participant population. They engage employers to identify the required technical skills and work readiness competencies as well as company-specific hiring requirements to increase the likelihood of placement beyond program completion. One program in the Merrimack Valley held a half-day event with potential trainees to assess aptitude, desire, commitment, and readiness to succeed in transportation and construction careers. Over 20 prospective students attended this “try-out day” to fill one of eight positions in the class. Employer and training partners in attendance completed a survey that included collaboratively-defined metrics and were involved in making the final candidate selections. Throughout this process, participants were able to demonstrate sufficient commitment and readiness for training and employment in a way that met both businesses and jobseekers where they were at. Experiences such as “try-out day” provide opportunities for jobseekers to learn more about the job and assess whether it is a good match for their own personal goals, work styles, aptitudes, and interests. 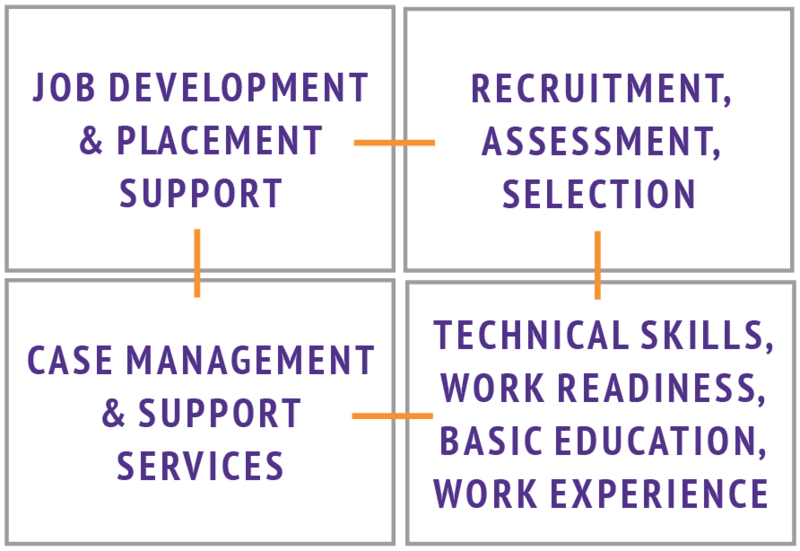 Strategic selection and assessment policies also enable programs to match their support services to their participants’ needs. In fact, we are currently trying out some of these ideas and more with our most recent round of WCTF grantees. Well-executed sectoral employment programs bridge businesses’ needs for skilled workers and residents’ needs for good-paying jobs. We know that early and on-going collaboration with employers is fundamental. Also, by gaining a deep understanding of the individuals served, programs can anticipate gaps and build appropriate supports into their program design. This requires working in and across business, education, government, and community cultures. Stay tuned for Rebekah’s upcoming post about developing sector partnerships! *We hope to see you at the CWC Conference on May 11th where Theresa and Rebekah will be presenting on the important first step of identifying which labor market problem you’re seeking to solve through your demand-driven sectoral employment program. Written by Anthony Britt, the Program Manager for the Workforce Competitiveness Trust Fund. Anthony joined CommCorp in July 2016 and is committed to improving outcomes for marginalized people through increased access to quality educational and economic opportunities and systemic reform.